I was going to pass on the first Thor film because I rarely enjoy the fantasy genre. I only went to see it because it was my friend's birthday and he's really into Norse mythology. The movie surprisingly worked for me. Asgard was beautiful, Thor and Loki's rivalry was interesting, and I loved the blending of science fiction and fantasy. The Earthbound scenes were weaker, but Thor's fish out of water humor made up for it. Thor beautifully blends science fiction and fantasy. 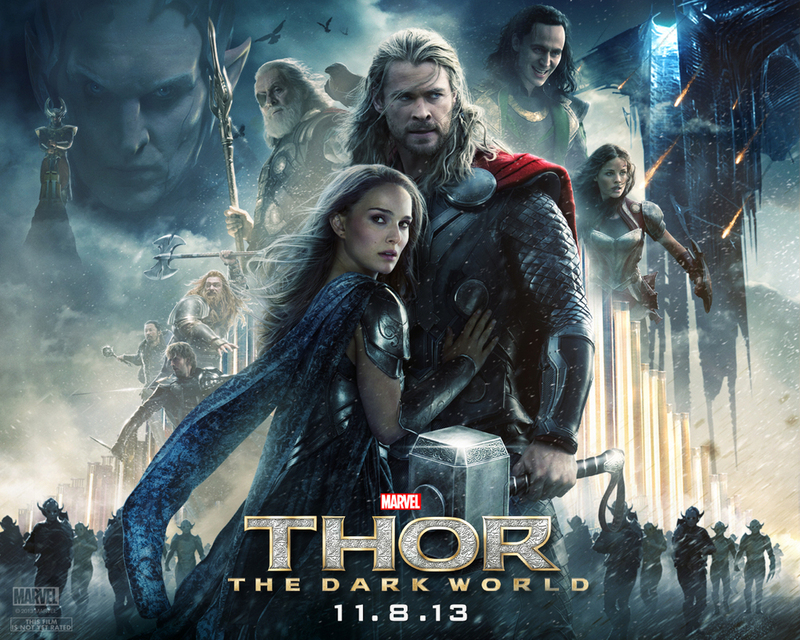 Thor: The Dark World retains everything that made the first film a success. We see much more of Asgard, its people, and their culture. Earth continues to provide laughs thanks to charming performances by Kat Denning and Stellan Skarsgård. I didn’t realize it in the first film, but the cast is very diverse. The five major female characters include a queen, two scientists, a soldier, and a physician. Unlike Lord of the Rings, people of color have a role to play beyond the forces of evil. It's great to see more female characters in superhero films, like the scientists played by Kat Dennings and Natalie Portman. Seeing the characters interact with each other is the best part of the film. Their relationships feel real. It’s fun to see Thor team up with his friends, but the most compelling scenes focus on his family. The messiness of Thor’s relationship with his brother, mother, and father is something everyone can relate to. I didn't buy the chemistry between Chris Hemsworth and Natalie Portman in the first film, but their romance is more authentic here. Thor: The Dark World does have issues that are becoming a pattern in the Marvel Studios films. The plot is hard to believe, especially when a character stumbles upon a secret well-guarded cosmic super weapon. The villain is absolutely forgettable, as is the film's score. Conversion to 3D added nothing to the film (besides the cost of admission). The action is more personal than Iron Man 3's, but it's still a CGI assault. Thor: The Dark World has one of the most forgettable Marvel villains. Despite these problems, I had fun watching Thor: The Dark World. I cared about the characters, enjoyed seeing them interact with each another, and loved learning about the universe in which they live. Christopher Orr, in his review at The Atlantic, said, "Thor: The Dark World often plays like a peculiar mashup of Tolkien and Star Trek—a Balrog here, a Romulan Bird of Prey there—with hints of Alien and Hellboy thrown in for good measure." He criticizes the film’s genre bending but that’s what I enjoy the most about Marvel’s Cinematic Universe – they always find a way to make their heroes accessible to everyone. For different perspectives, check out Rolling Stone’s and NPR’s review. If you’re interested in Thor and Loki's sibling rivalry, check out the psychology of siblings (explained using The Simpsons).